Above, left, the Rev. Bud Cederholm. Center, wedding of Judy and Wendall Barwood, March 17, 1961. Right, a luncheon on the church lawn. St. Paul’s story begins in the middle of the Civil War when St. James Episcopal Church in Woodstock, Vermont started sending their priest over to White River Junction. Services in private homes grew into a mission church in the back of Glover’s Clothing Store, and in 1874, the original church was built downtown. By 1882 St. Paul’s was able to support a resident priest, and in 1896 started the mission church that later became St. Barnabas’ Episcopal Church in Norwich. The Golden Age of Railroading brought prosperity and in 1909, the parish was able to build a rectory. The parish flourished through both World Wars and the Depression, calling The Rev. E. Briggs Nash to be St. Paul’s first rector in 1935. During this era, some long-lived parish traditions began. The Turkey Dinners were served for fifty years, and the Holiday Bazaar is still an early November event. The original St. Paul's Church was built in White River Junction in 1874. By the early 1960s, the old church was in disrepair and in 1962, land on Taft’s Flat was purchased as the site for a new church. The old church was sold and the loss of the beautiful stained glass windows is still a regret among those who remember them! Ground was broken in 1963 with hopes that a new building with adequate parking would allow the parish to expand. The new building’s design reflected the times, keeping everything on one level, with pews positioned in the round. The new church was dedicated on April 18, 1964. 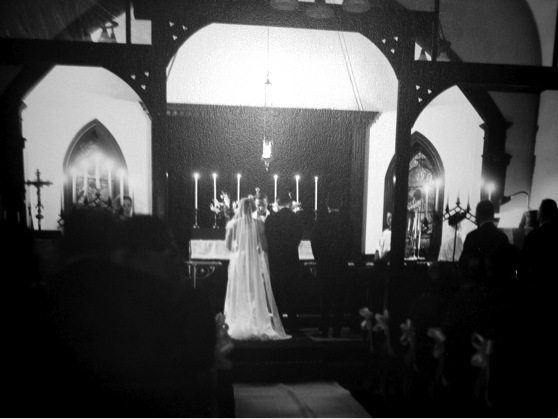 Parishioner sisters’ weddings bookended the transition by being the last to marry in the old church, and the first to marry in the new one. The 1960s gave rise to the “Upper Valley” as a regional identity and the intersection of I-89 and 91 encouraged greater growth in the area. Early in the decade, a youth group was formed to meet the needs of young parishioners in a decade of unrest, and the intermittent tradition of the Bargain Bin (our rummage sale) was introduced. The parish was blessed with the guidance of The Rev. Kendig B. Cully during an interim period. The 1970s was a decade of change in the nation. The greater Episcopal Church saw the ordination of women and an updated Book of Common Prayer, and Vermont kicked off the recycling movement. St. Paul’s parishioners pooled their talents to construct a new pitched roof on the Parish Hall, and began exploring the establishment of a mission church in Fairlee, which would later become St. Martin’s Episcopal Church. In 1976, The Rev. 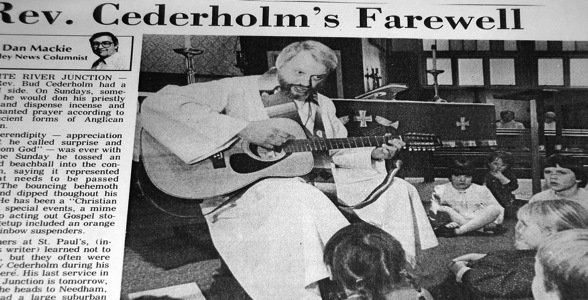 Roy F. “Bud” Cederholm was called to St. Paul’s. During his tenure, outreach ministry became central to St. Paul’s identity, including community dinners, charity walks, Holiday Baskets, and prison ministry. In the years that followed, we were among the churches that founded the Upper Valley Haven (the social services agency that's right next door), the Good Neighbor Health Clinic (which started life operating out of our rectory), LISTEN community services, and others. Our annual summer family retreat at Rock Point started during this time, as did our expansion of the liturgy to include other traditions and music. After thirteen years with us, Bud was called back to the Diocese of Massachusetts. In 1990, The Rev. John van Siclen was called. Parishioner Diana Collins was ordained and assigned as our deacon, bringing with her the Honduras ministry, which broadened our awareness of need in the world, as did our “adoption” of children needing support in India. During this decade, Vermont became the first Episcopal diocese to have a female Diocesan bishop. After John left in 1999, The Rev. Jean Austin came for a wonderful interim time. Her civil union was the first to be celebrated at St. Paul’s. We became more involved with outreach, dedicating 10% of our annual pledging to such projects. The Rev. Nancy A.G. Vogele was called in 2001. Nine months into her tenure, the tragic events of 9/11 occurred and we found ourselves focusing on the resultant hurt and need to heal. We had a series of frank and open talks that became the pattern for St. Paul’s when handling sensitive or upsetting events. Dan Weiser, our new music director, began his seven-year tenure on the Sunday following 9/11. Dan’s talent and professionalism set a new standard for our music ministry. Our Youth Ministry flourished with numerous local events and a yearly trip farther afield to places such as New York City or Washington, D.C. These adventures cemented friendships and encouraged our youth to regard the church as much more than just a place of weekly worship. St. Paul’s even had a youth rock band, called “The Pink Saints of Paul,” that performed at local and diocesan events. We continued to enjoy different and emerging liturgies, and widened the circle of those who served at the altar or preached, including our graduating high school seniors. These years saw the welcoming of the LGBT community, the introduction of the EfM program and DEUS small group prayer circles. Families were flocking to St. Paul’s and for many, these were spiritually rewarding times. St. Paul's was a major staging area for relief efforts after Tropical Storm Irene hit in 2011. On August 28, 2011, Tropical Storm Irene flooded the Upper Valley, devastating the area along the White River. St. Paul’s responded to the immediate needs of those who had been affected by creating a food ministry that provided daily deliveries of hundreds of sandwiches and hot meals for a period of weeks. The larger community supported this ministry, seeing St. Paul’s as the organizing force behind food distribution. St. Paul’s remained an active part of the ministry, and at the one-year mark, the transition was made to community leadership. After Nancy's departure in 2012, the Vestry called The Rev. Mark Preece to be our interim rector, and during his time with us, St. Paul's focus has been on our internal community, reevaluation of our mission, and preparing ourselves to welcome a new permanent rector. A very well attended women's retreat in April 2013, an equally successful parish retreat in October 2013, and the discernment process parish-wide meetings are only a few events that have kept us aware of how deep our commitment to each other and the community of God is at St. Paul's. In July 2015, The Rev. Scott Neal will join St. Paul's as our permanent rector. We are looking forward to a busy summer and the beginning of our journey together.